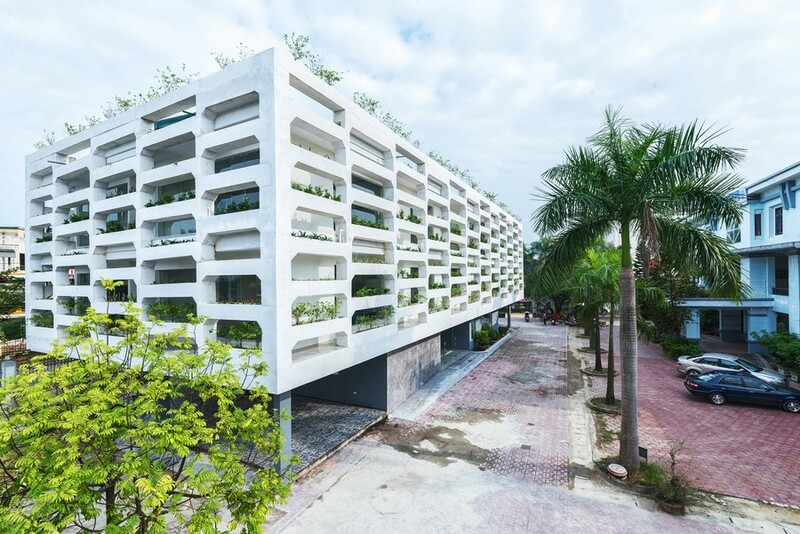 Located at the heart of Ha Tinh city and on a street with many governmental offices, the Coordination Committee SRDP-IWMC Ha Tinh Office is the headquarter of the SRDP project (IFAD organization) and IWMC project (ODA funded by Belgian government). The total cost is limited and the existing office furniture should be reused as much as possible. Climate change is a remarkable issue and has affected comprehensively on the Ha Tinh’s urban and rural areas. Moreover, the rapid urbanization has been making the rural area imbalanced. The agricultural land has been reduced, which seriously impacts on the stable lifestyle of the local community. The project’s design concept is a synthesis of Sedentary Cultivation and Settlement aiming to three objectives: Iconic imagery + Low cost + Quick construction. The three-storey building block is placed to East-West direction. The two upper floors are covered by a lattice structure full of plants and crops which we call the Vertical Field. The structure which is comprised of 400mmx400mm concrete blocks stacked vertically embraces the entire inside work space. The irrigation system is integrated inbetween the blocks’ joints, minimizing the negative impact of the local urban and climatic problems such as noise, air pollution, overheat and typhoon. At the same time this agriculture-friendly working environment creates a different experience for the users who can plant vegetable by themselves. The project is an idea of improving usage of vegetable in urban context and still meets energy demand in the future. The synthesis between agriculture and architecture is the foundation for sustainable development.